is for you to choose one of the DT cards and CASE it! We would like you to say which card you have chosen and if possible add a pic of it to your blog stating how you approached your design. You might follow a similar layout, colour scheme, subject matter or simply do a close copy of it. Here they are for you to choose from. Ok so it's a shaker card which can still be CAS - yeah! embossing, shakers, colours, dies or go with a wedding card. I can't wait to see how you interpret my card. The main thing ... have FUN! 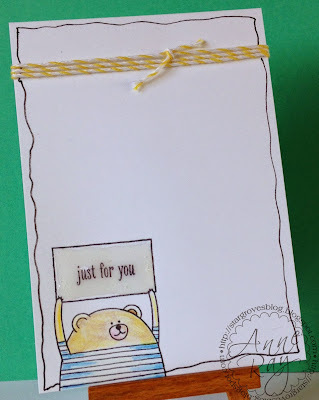 My card for CASEing is a simple one layer effort, using an adorable Stampin' Up image from the Cheerful Critters set. He's coloured with watercolour pencils and the sign has a layer of Glossy Accents. A doodled border and some baker's twine completes the card. Here are some new acquisitions! 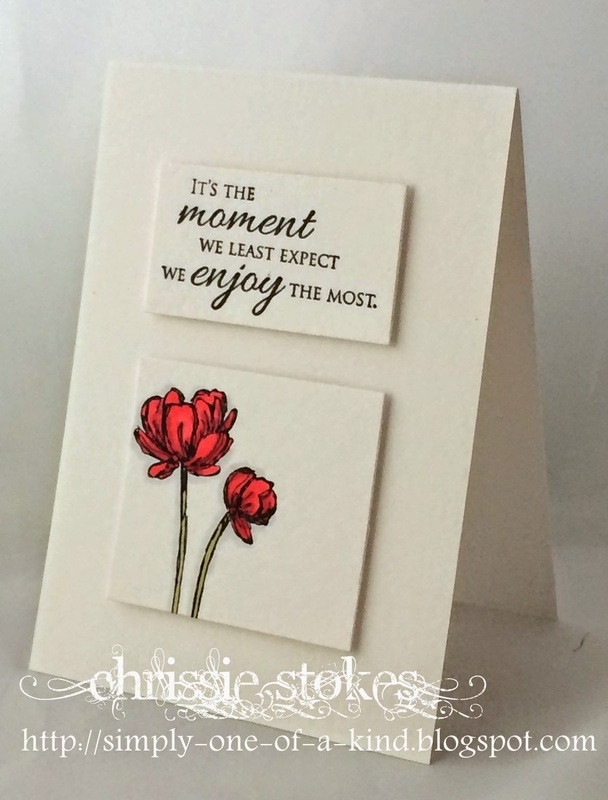 The flowers are from Stampin' Up coloured with alcohol markers and the sentiment is from Penny Black. I have found this sentiment to be really true... and how precious those moments are. Anne has been smitten with a sickness bug for the last week and so has not managed her usual number of visits and comments, but she hopes to get around to everyone now that she is feeling a little more like herself! All three of us should be at the craft show at the NEC today... it would be lovely to say hi ... should we bump into any familiar faces. This should be a fun challenge, we can't wait to see how you approach it! FAB challenge - I was torn between my all time fave sketch and the purple challenge - bet you can't guess which one WON!! Mind you, it very nearly used the sketch too! Oops, looks like I went off like a rocket and may have misunderstood the brief - oh well, I'll just have to have another go then! Right deleted the dud (which I'm secretly rather pleased with but hey ....) and entered a more fitting card!! DOH! That will teach me to read the brief THOROUGHLY!! !